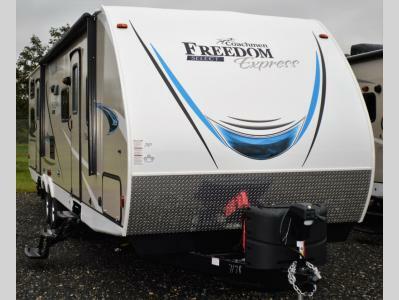 If you enjoy "double the fun" everywhere you go, step inside this Freedom Express Select 31SE travel trailer. 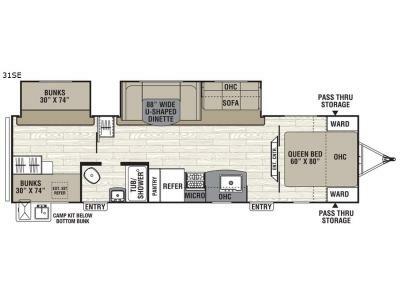 You and your larger family will be the talk of the campground with all the features this model has to offer. Just imagine the kids hanging out on a rainy day in their own private bunkhouse. There is a set of bunks on each side, storage, and plenty of floor space to spread out thanks to the slide. Everyone is sure to appreciate the dual entry doors for quick access to the bathroom or to the main kitchen and living area. The second slide also provides more floor space to move from one end of the trailer to the other. The chef in the family can cook inside, or outside on the outdoor camp kitchen. 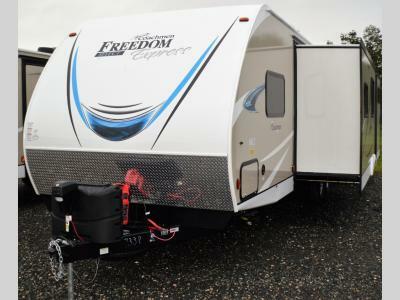 You will find storage for all your items inside, plus the exterior pass-through storage allows for some larger camping gear. Load up and head out to make memories for a lifetime!